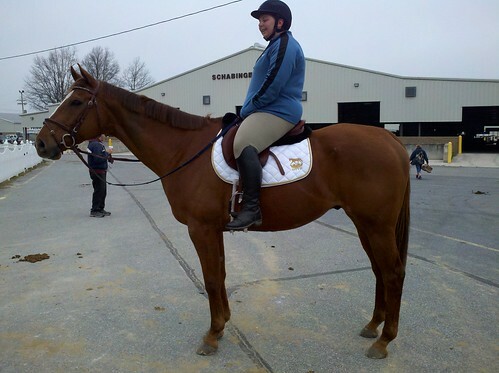 We had been asked to ride in the parade of breeds for the Delaware Horse Expo representing ottb’s. 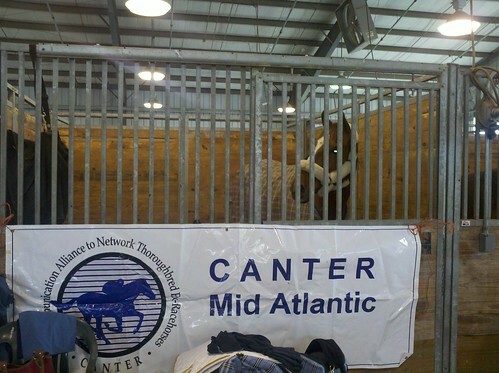 I figured it was a great opportunity to show off what CANTER MA does and meet some new people. My local area consists mostly of western riders and either quarter horses or standardbreds. I had planned on taking Areutrue but we think he just slipped in the field and twisted his ankle. I had the vet out and she said he’s hardly even noticeable but it was enough for me to just have her out to make sure I wasn’t being too casual about it. He is getting a rest and I will evaluate him this week. I’m sure it’s just a case of boys being naughty in the field! 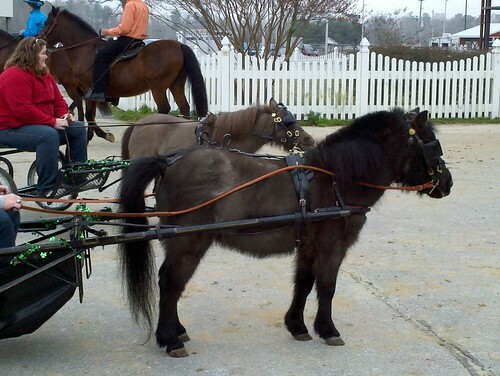 I had asked Michelle Byrum if she was interested in bringing her horse that she bought from CANTER. 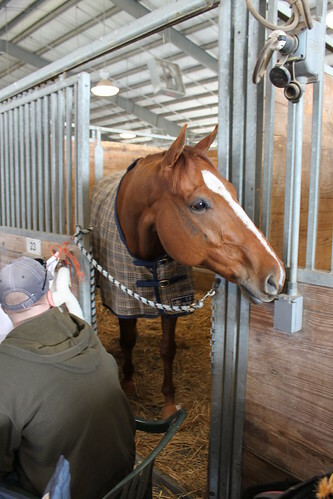 Rustyshouldrun is another horse that has a great mind and I thought he could handle the crazy chaos that goes along with these types of events. 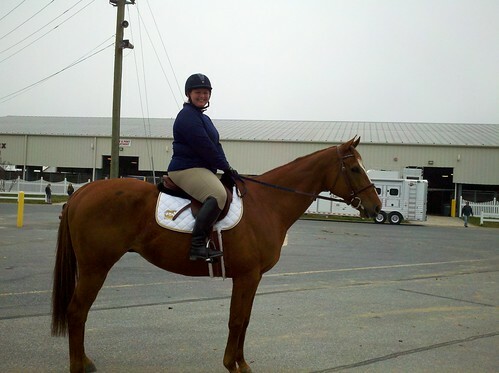 She was thrilled to represent ottb’s/CANTER MA so we kicked off the weekend with her first trail ride on Rusty. I took this photo to document Michelle’s first trail ride and I was cracking up when I saw it. Rusty is exhausted and ready for his nap and Michelle is on a natural high that you get from an awesome trail ride. We left bright and early Saturday morning to haul into the expo. The barn was super busy with lots of horses in and out. Rusty settled right into his stall and went to eating his hay. He thought the standardbred across from him was pretty cute. We got him tacked up not really knowing what his reaction was going to be. 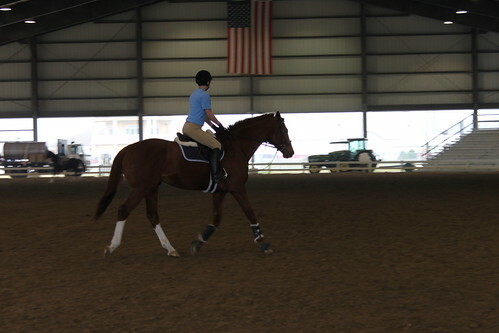 There were 20+ horses in this indoor ring riding around at all speeds. Lots of people walking up and down the noisy metal bleachers. Horses carrying flags. Loud speakers making a bunch of noise and much more. Rusty had never been to a horse show so besides the racetrack he had never seen so much commotion. I know Michelle was nervous but she must have a lot of trust in Rusty because she didn’t show her nerves. I advised her to just go in and let him trot if he wanted to because letting them go forward always helps. Rusty didn’t seem to care about a thing as you can see in this video. 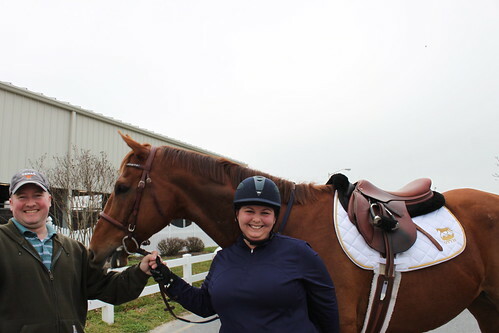 I was super excited to see another former horse- Auto Pilot representing ottb’s and Gambler’s Choice Equestrian Center. You all may remember him as the 10yr breeding stallion that was found at New Holland with a bunch of mares and foals on Kentucky Derby Weekend 2011. 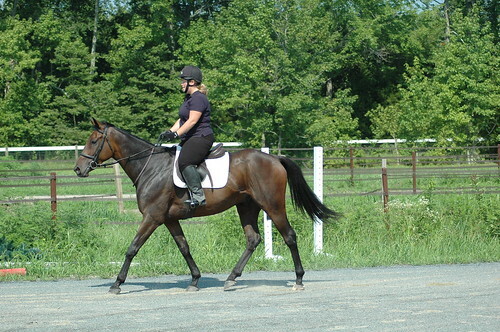 I helped rehabbed him, had him gelded and he was sold to his current owner (Amy Johnson) who adores him. We are all grateful to his many supporters who paid his way out of harms way and enabled him to get a proper start in life. Doesn’t he look amazing! We took Rusty home overnight and brought him back again today for round 2 of the horse expo. He was even more relaxed today if that is possible. We did find one thing that got him a bit upset. MINI’s!!!! 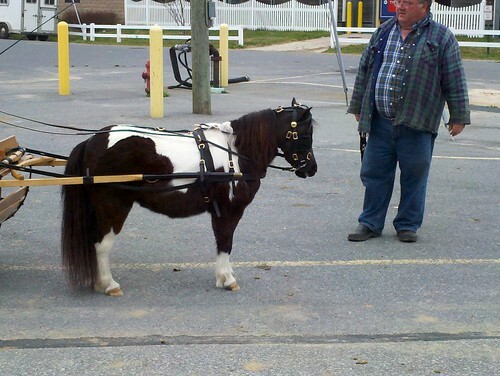 Mini’s pulling carts OMG. Rusty’s version of being scared was to plant himself and not move. He was not convinced he could walk past those scary things attached to carts. I went and got him to get him into the ring and he was back to his normal sleepy self. It is really rewarding for me to see my former horses out and about. CANTER MA horses rock! I would have to look back but I believe that Letterman arrived from the track in September of 2010 and hung out at the lay up farm until July of 2011. He had a nice rest because he raced a long time and he really needed it. When I started him in work he was sort of a miserable type of dude. You could tell there was an athletic horse in there waiting to come out but his body hurt and he was just grumpy. I avoided ring work and did tons of trail riding and started to take him on the paper chases which is what lead me to realize that he was so fun I just had to buy him for myself. I really enjoy riding out of the ring as much as possible to escape the stress of everyday life. He is a horse that I just go out on and come back smiling every single time. When I bought him, I hoped that he would like to event. However, he didn’t appear to love jumping. He was sulky, scared and didn’t show a lot of natural form. However, in the free jump I saw an athletic horse that had all the right parts. I played around with baby jumps just to see if he would start to become interested but in the ring he hated jumping. It wasn’t much better out and about. On our first paper chase he was terrified of going over a 18″ log 🙂 I did get him over at the walk where he jumped it 4ft in the air but we managed to jump it civilized the 2nd time. Thankfully, I had nothing but time on my hands. Kurt and I rode out on a few chases and with Junior giving him leads he realized the only way down the trail was to go over the jumps. 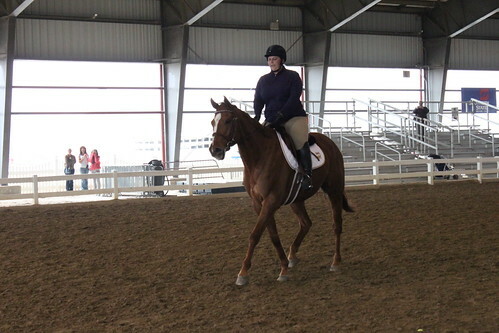 In the ring, he wasn’t quite convinced and we had frequent stops for no apparent reason. I decided that I was just going to take jumping out of the equation for a while so I didn’t jump for a few months while I got him stronger in his body with flatwork and trail riding. When I returned to jumping he was no longer scared and reluctant to go forward. Now he was understanding that the goal was to go forward and over. 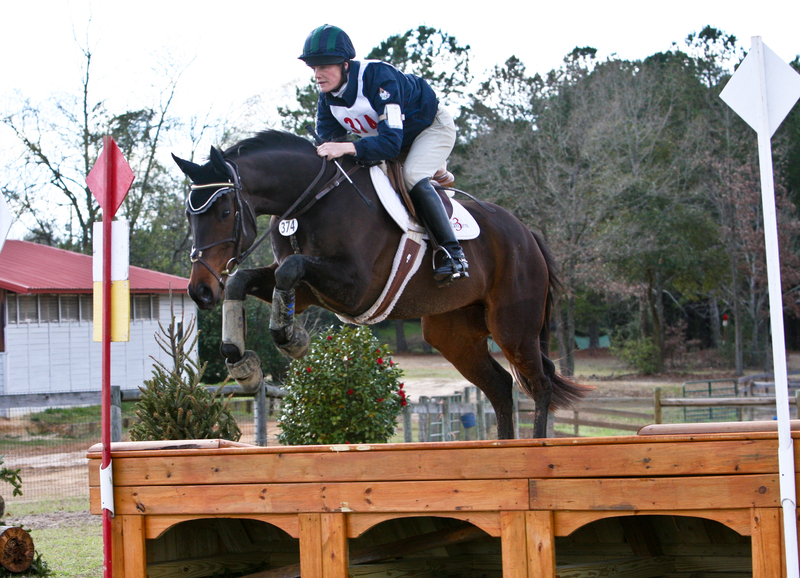 I schooled him once out xc last season just jumping 5-6 jumps. He was unsure but willing to give it a try. During the winter, we have just played with very simply jumps learning to trot in and canter out. We slowly built up to adding in some canter jumps. He has a fantastic canter but we don’t steer well at the canter so jumping lines is still a bit of a challenge. In the last month or two, he has become quite cocky about the jumps. He’s got it and he wants me to just sit there and shut up. Excellent! I was waiting to see if this would happen and boy was I thrilled to see him coming around. He’s coming out of the corner looking for the jumps. What he used to be scared of he is now thinking about but still jumping. When he is thinking really hard he breaks to the trot but that is just fine and you have to allow them to look. I don’t what to rush him to the jumps or shove him down to them. It has to be because he believes he can. I signed up for a Steuart Pittman clinic this weekend so I decided I would take him out on a nice hack on Friday to allow him to work out some energy. It was his first time trailering off the farm solo for a trail ride (Kurt is away for 6wks) and he was a bit nervous. No more than 5 min into our ride we are trotting at a nice clip when we scare up a large flock of wild turkeys which take off running and flying all directions. I think Letterman was so stunned he didn’t quite know what to do. His legs went every direction but he stayed underneath me. We had snorting, tail over the back and prancing that rivaled a fancy dressage horse 🙂 The turkeys all ran down the path that I had to ride down so he was pretty scared but he marched down there anyway. I was so proud of him! I could ride this horse all day long. We had a great trot/canter and even walked in the scary water on the way back. Saturday we headed off to the clinic on a chilly mid 30’s morning. I thought he would be nervous but he was quite behaved coming off the trailer. I tied him to the trailer to tack him up and he looked around but stood quietly. He likes to go..go..go when you get on and that is okay. I let him trot around in whatever fashion he wants to go in until I feel him relax. He looked like a giraffe on crack for about 15 min but that was fine by me. He gets pissed if you touch his mouth and ask him to start doing things before he is ready so I know that I just sit there and shut up until he’s ready. He feels like a lot of horse but he never does anything wrong. We had a nice group of four riders which is perfect for starting the year out in a civilized fashion. I don’t like mass schoolings as I think it makes it hard for the horses to concentrate. Steuart asked me to lead off the group and I thought oh boy this could be interesting because Letterman isn’t the bravest horse in the world and he would have to go away from the group. He was pretty sticky over the first few logs but he went! Good boy!!! 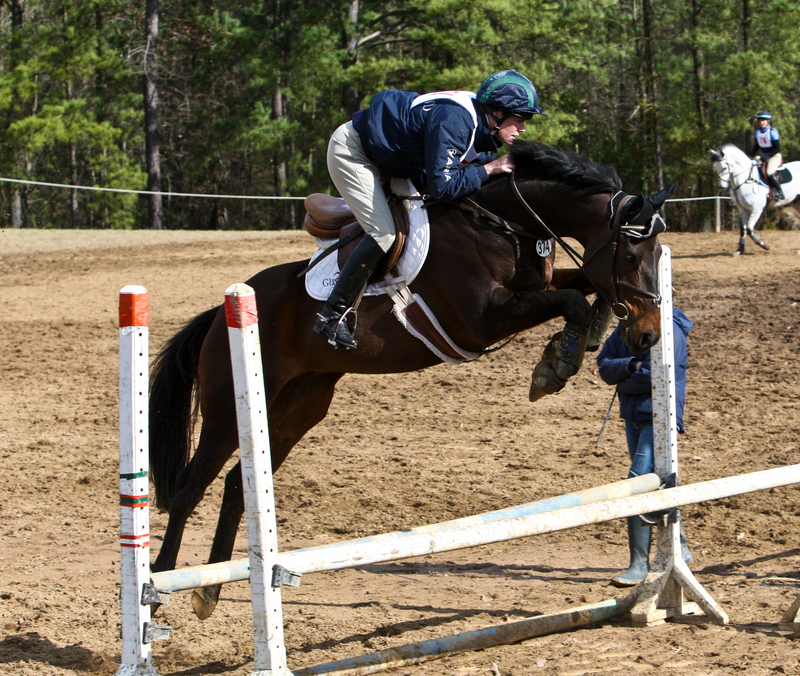 He makes some awkward jumps at the trot because he is thinking so hard. You can feel him going oh lord..log with straw under it..bigger log with straw under it…scary..I’m scared…but I can do this..okay here we go…lands and does happy shaking of head..that was fun. We practiced trotting a log and cantering to another and he reminded us to just stay up and let them sort it out. I’m just starting to canter fences but it felt way better than I expected. The bigger the fences the better I felt that I could balance the canter up. We went out and put a little course together. I went out first and Steuart told me to turn left and jump a log going away from the group. You went way out and then turned around and came back toward the group to continue this little course. I thought he told me to jump some ramp thing but it wasn’t the one he said..I was making up a course as I went along just throwing in random fences. What shocked me is that Letterman didn’t care a little bit about leaving the group (no sulky behavior, wiggling, dropping the shoulder or other greenie stuff) and he didn’t speed up coming back to the group. I cantered right past the group continuing on my course and he didn’t even slow down he was looking for more fences to jump. We ended with a bigger flower box thing and boy did he jump that good! To end the day, we put a course of four fences together. We jumped a rolltop coming toward the group and coop going away from the group. Then we turned and came back jumping a green house going past the group again and jumping a nice sized ramp. These were bigger fences than we have been jumping..probably BN height at 2’6″ and more looky but he felt super confident and the bigger they were the better he jumped them. I was just so thrilled with him and how far he has come. He really left the day understanding his job and feeling confident. I could feel him reading the fences and setting himself up. I would have loved riding him regardless of whether or not he wanted to event but the fact that he does enjoy it makes me even more excited about him. He is very much a horse that just needed time to build his confidence. I think if I would have pushed him too soon he would have just shut down. He’s ready now and we have a fun season ahead of us. 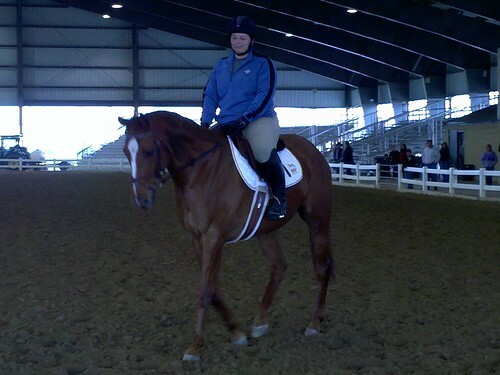 My mom was also in our group on her 4yr CANTER horse, Hold that Halo. He was amazing and jumped everything with ease. 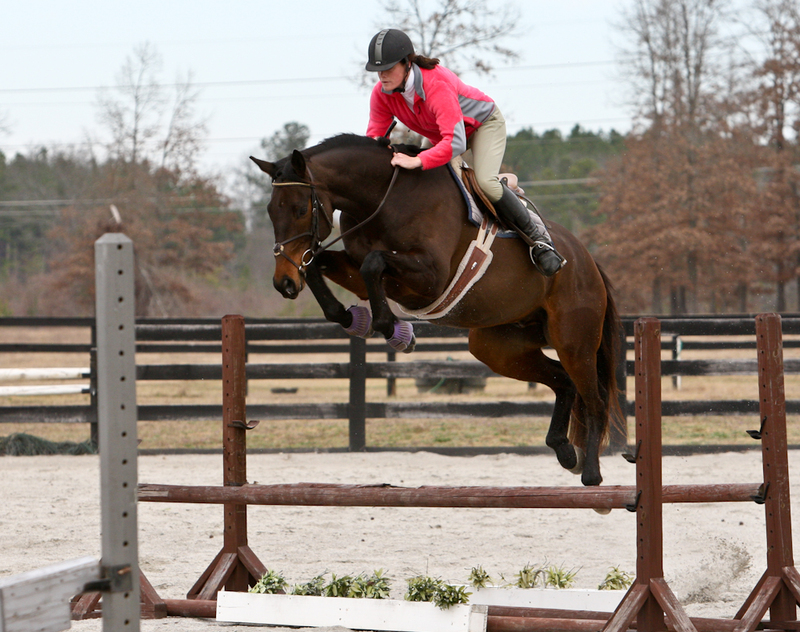 He also enjoyed the bigger fences! I think that Steuart is coming back in 2wks and I hope to go again. I love talking about the horses that I have been involved with and I have been dying to tell the story of a horse named Track’s Protege. 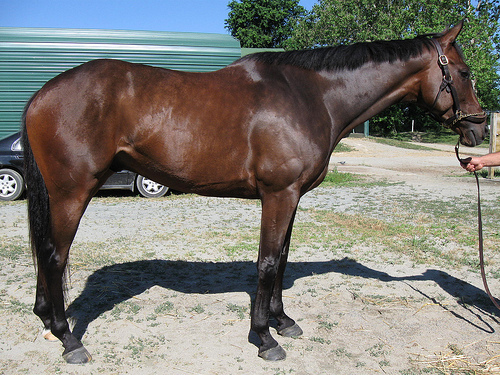 Breeding here http://www.pedigreequery.com/tracks+protege. He started running at age 5 where he raced 3 times ending up near last in all three starts. I first came across him when I was getting ready to put up his listing for Delaware Park CANTER listings. He was just a plain bay but there was just something about him that spoke to me. His stable manners were absolutely horrible. He was terrified of everything, hard to catch, cranky and sure wasn’t fun to work around. I rode him once before we took him to our layup farm and it took me 20 minutes just to get on him because he was scared to death of me standing over him on the mounting block. Once I was on him he was perfect but you could tell he just had some quirks. I remember the day we were loading him to take him to our layup farm. I had brought him in from the field with his fly sheet on and was trying to remove it and he wouldn’t let me touch the back leg straps. He was throwing an absolute fit. I gave up and just loaded him with the damn sheet on. I was eager to get him off my farm 🙂 He just needed some time to decompress! You knew there was a nice horse in there so we figured time would heal all. 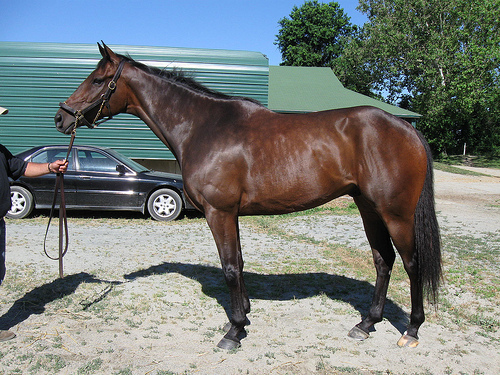 Sonrea (the stablemate that Track arrived with) and Track became a nightmare at the layup farm. They were attached at the hip and difficult to handle. When Allie was looking for a shipment of horses to go to North Carolina those two were eagerly volunteered 🙂 Track got down the North Carolina and proceeded to have an intense dislike of coastal hay and colicked several times badly enough that Allie moved him to her barn to monitor him. She had been in love with him but like the typical horse person she needed another horse like she needed a hole in the head. She did try to market him a bit but nobody wanted him because again he was just sort of plain and has some big osselets. Allie had just been enjoying hacking him out and forming a partnership with him. She xrayed those ankles and sure enough they were just calcification and not career limiting. Allie said they are pretty big ankles..I say Letterman’s ankles are bigger but only she and I would be goofy enough to be arguing over who’s horses ankles are bigger 🙂 She decided she would buy him for herself as her event horse was retiring. Her goal was just to event him at BN, foxhunt and hack out with her friends. She happened to free jump him and discovered not only was he as talented as she thought he would be but that he had something that most people would pay a ton of money for. That is a recent picture of him jumping with Liza Horan riding him but it gives you an idea of what Allie saw that day when free jumping him. He just kept coming around the ring and jumping like that every single time. Knees to the chin like it was no big deal. Allie took her time bringing him along and didn’t jump him for a long time. 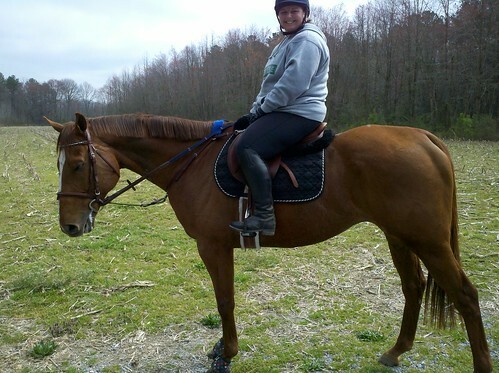 She hacked him out on the gorgeous sandy trails behind her farm and worked on some lunging. She then started jumping just baby jumps so that he learned that jumping wasn’t such a big deal. Sometimes horses tend to jump like that when they are scared and she didn’t want for him to be scared. She nurtured his talent along until he was ready. He had been out foxhunting and was fantastic. 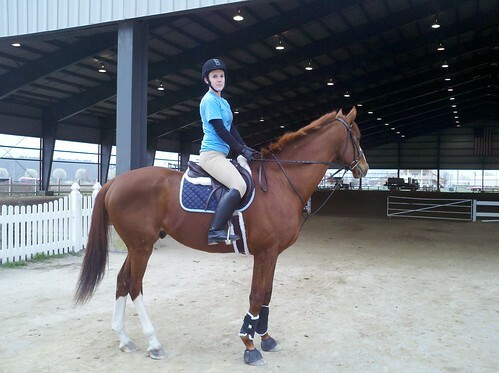 He is now beginning his event career and competed in his first event with Liza Horan riding. He has gained a huge following of people who are simply amazed at his natural ability. 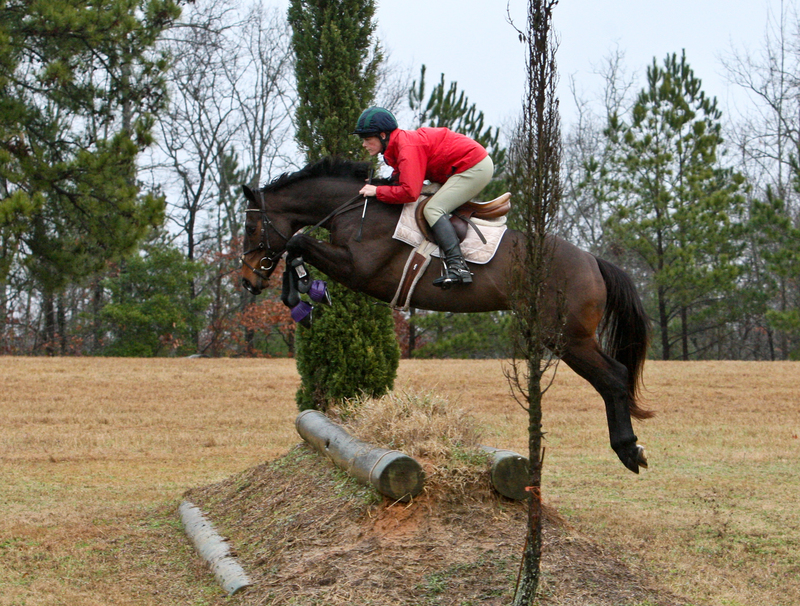 He could probably do the big time hunters ..or jumpers..or eventing. Sky is the limit! You wouldn’t think that it would be fun to own such a talented horse but I imagine that it is pretty darn stressful. You have everybody pushing you to allow your horse to continue to be ridden by professionals and compete at the upper levels but you just wanted to enjoy your horse at the lower levels because he is everything you ever wanted. Do you risk him getting hurt on his way to the upper levels or do you just own the most amazing BN/N horse in the whole wide world????? I am not sure I would want to be faced with that decision but I know that Allie always has her horses best interest in mind and will do whatever is best for the both of them. She is really enjoying watching her horse out there showing that ottb’s are amazing and every bit as talented as the fancy warmbloods. We would also be lying if we said that we didn’t enjoy saying I told you so to all those who doubted us when we said this horse is the real deal or those who passed him over when we were marketing him. I personally hope that Track’s Protege and many of our other CANTER MA owned graduates, go on to prove that just because horses are donated to CANTER does not mean they are not nice horses or that they are not sound. Most of our horses are donated because their owners care about them and know that we do an amazing job of finding them new homes. That is something to be proud of and I hope that we have many other horses that will highlight the great work that CANTER MA is doing. Letterman’s Humor, King Remda, London Lullaby, Dazzle and Shine, Sonrea, Track’s Protege and Big Talk were all donated to CANTER MA by the same trainer. Every single one of them are just lovely horses that were sound and well cared for. I will have some updates on some of them coming soon.